Hello and Welcome to another Stamp Review Crew Blog Hop! 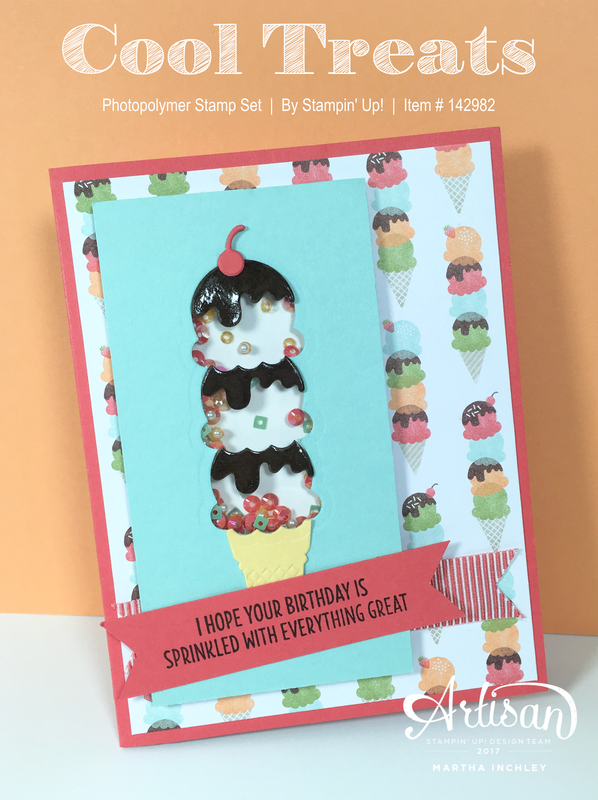 This week's featured stamp set is Cool Treats! A fun and yummy stamp set! Today I'm sharing 2 samples! The cards I'm sharing today are actually cards that I created for 2 different classes: a Shaker Card Class & a Cascading Card Class . 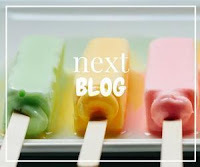 My customers loved creating them and the "Cool Treats" Bundle! 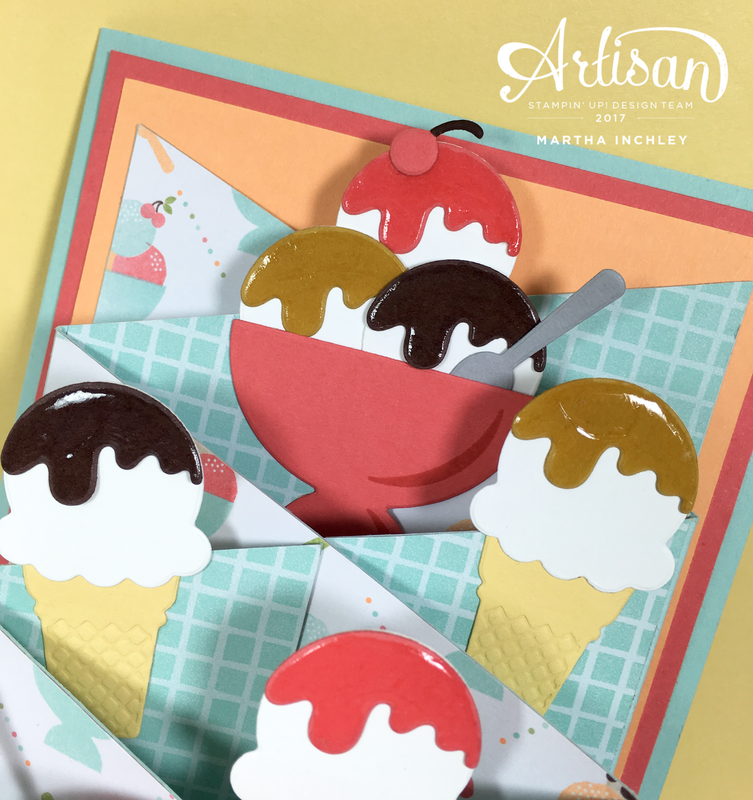 Both cards use the "Cool Treats" stamp set, the co-oridinating "Frozen Treats" framelits, and the "Tasty Treats" Specialty Designer Series Paper. I Love this whole suite! My first card is the shaker card. The colours I used are: Whisper White (cardstock), Soft Sky (cardstock), Watermelon Wonder (cardstock and ribbon), Early Espresso (cardstock and ink) and So Saffron (cardstock). To make the shaker component, I used the Window Sheets, Foam Adhesive Strips and of course the fun and colourful Sprinkles embellishment! To make my chocolate syrup, I die cut 3 pieces of "dripping syrup" from Early Espresso cardstock. I then took the "ice-cream scoop" die and used it to cut off the top of 2 "dripping syrup" pieces. I then covered the 3 pieces with the Fine Tip Glue Pen and allowed it to dry over night! Doesn't it look so sticky and yummy! My next card is the Cascading Card. How fun is this! The colours I used are: Whisper White (cardstock), Soft Sky (cardstock), Watermelon Wonder (cardstock and ink), Peekaboo Peach (cardstock), Early Espresso (cardstock and marker), So Saffron (cardstock), Smokey Slate (cardstock) and Delightful Dijon (cardstock). Don't you think Delightful Dijon is just the perfect colour to use for butterscotch or caramel sauce!?! And of course, the Fine Tip Glue Pen just completes the look. I used Early Espresso cardstock for the chocolate sauce and Watermelon Wonder cardstock for the strawberry sauce. Now all I need is some bananas! The fun thing about this card is that it actually pops out, allowing you to slip in little components and embellishments to make up you card. 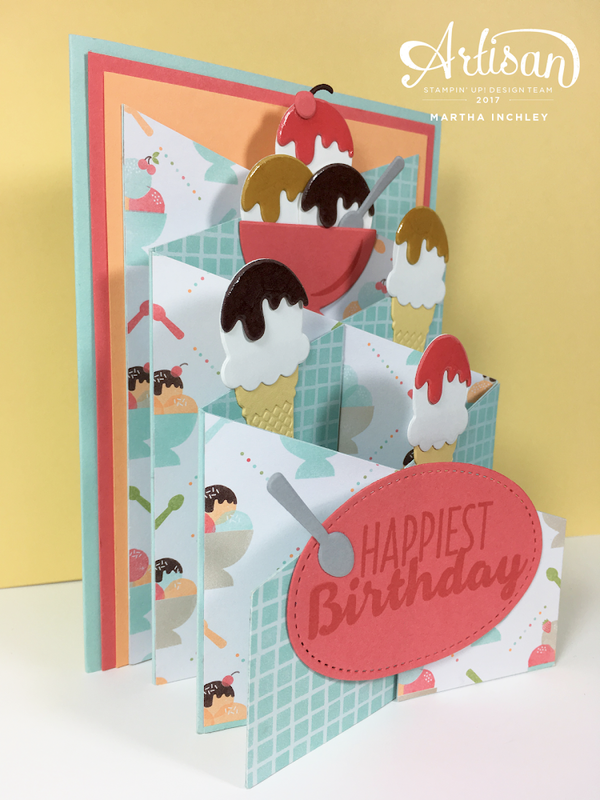 This fold is great to create little sceneries with, and the best part: it folds flat to mail! Do the happy dance! If you're wondering how to do this fold, just google "cascading card" and you'll find a ton of tutorials available. Well, thanks for hopping in, I hoped you enjoyed my two cards today. Up Next is the Talented Ann Schach! Enjoy the rest of the hop and Happy Creating as always! What a amazing cards, Martha! 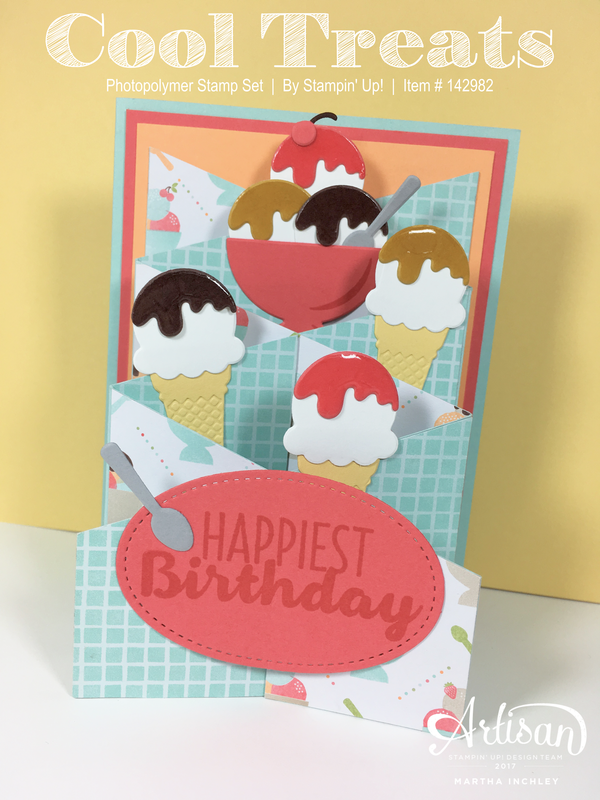 I love your triple decker shaker, and this set is perfect for cascading cards! What a fabulous idea! OK, can I just say WOW?! All right, I see that has already been said a few times. But dang lady! These cards have Wow-power! 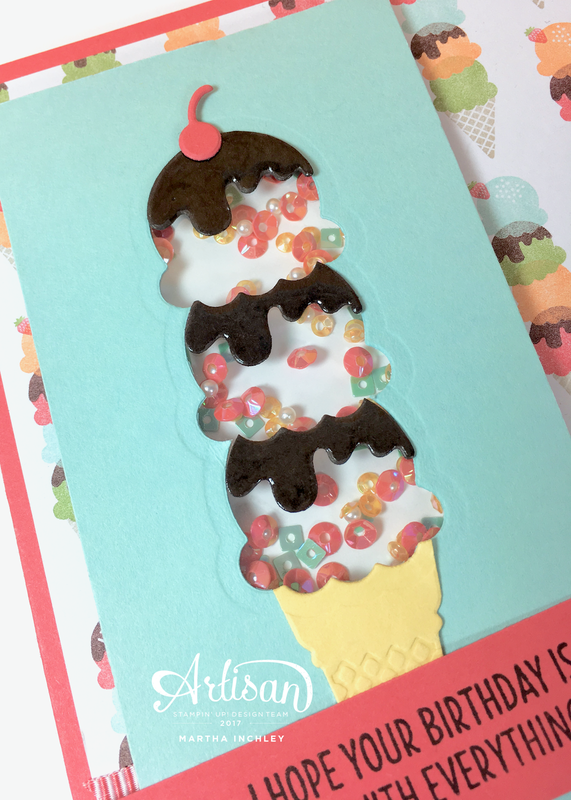 Love the glossy syrup, and the tip for creating the layered look on the first card. You rock Martha! I love them both. Your coloring is so yummy! 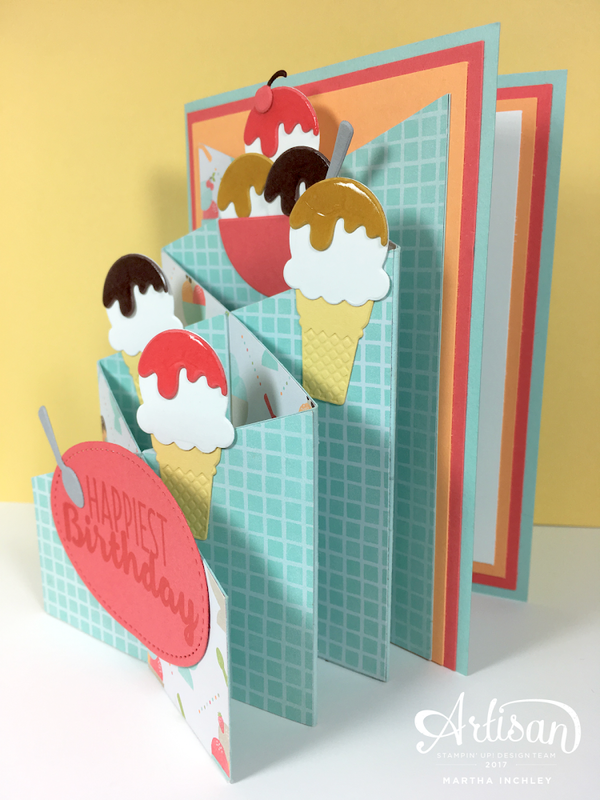 And I have to try making one of the cascading cards...so cool! Oh my goodness! What fun projects. I do love a fancy fold so your second card jumps right out at me. The shaker card is also a work of art. Such fun cards. That cascading card has got to be my favorite! Love it! Both of these cards are amazing and so interactive. I LOVE the triple decker shaker. What a fun shaker card. Your chocolate on the shaker card is so lifelike and yummy!